This article is about the Billy Joel song. For the Bruno Mars song, see Just the Way You Are (Bruno Mars song). 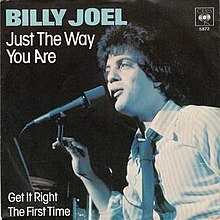 "Get It Right the First Time/Vienna"
(1974) "Just the Way You Are"
(1977) "Movin' Out (Anthony's Song)"
Joel shared that the melody and chord progression for this song came to him while he was dreaming. In an interview on the Howard Stern Radio Show on November 16, 2010, Joel revealed that the inspiration for writing the name of the song and how it sounds in the chorus was directly taken from the last line in the Frankie Valli and the Four Seasons song "Rag Doll"; which incidentally was also a larger inspiration for Joel's later song, "Uptown Girl". The song, which Joel had written for his first wife (and also his business manager at the time) Elizabeth Weber, was not liked by either Joel or his band, and Joel had originally decided against making the track a part of The Stranger, but at the request of both Linda Ronstadt and Phoebe Snow (both were recording in other studios in the same building at the time), he agreed to put the song on the final mix. However, the album's producer, Phil Ramone, later contradicted Joel's claim, stating in an interview that they could not afford to exclude the song because Joel did not have that much material to choose from for the album. The song also shares some similarities to "I'm Not in Love" by 10cc, due to the keyboard and background vocal tape loops Joel and Ramone used. After Joel and Weber split in 1982, Joel rarely performed the song live after 1986 until the 2000s, and Joel has publicly stated that he disliked playing the song live in the wake of his divorce from his first wife. He noted that during performances of the song around the time of his first divorce, his drummer Liberty DeVitto would jokingly parody the lyrics in the chorus as "She got the house. She got the car." When "Just the Way You Are" was released as a single, it was shortened by over a minute. The differences are the removal of the second verse and an earlier fade. A live performance of the song was also used as a music video. On February 18, 1978, the song peaked at #3, and Joel performed a shorter version of the song as the musical guest that day on Saturday Night Live (along with "Only the Good Die Young"). The single version (fading 8 seconds later) was included in the first release of Greatest Hits Volume I & Volume II, but the full album version was restored for the remastered release of that compilation. The saxophone solo was played by Phil Woods, a well-known jazz performer and Grammy award winner. Woods was criticized by some purists[who?] in the jazz community for playing on a rock session, but in fact he had already played previously on such sessions both for Steely Dan and for Paul Simon. The performance here on a hit record undoubtedly exposed him to a wider audience and introduced his music to rock fans. Harry Connick Jr. on The CD Your Songs from 2009. Saxophonist Houston Person on his 2010 album Moment to Moment. Diana Krall on her CD Live In Paris from 2002. José José on his album Lo Pasado, Pasado ("Te quiero tal como eres" in Spanish). Barry White on his album The Man on 20th Century Records in 1978. Some Yamaha electronic keyboards from the 1980s used the song as a demonstration track. ^ "Past Winners Search". The Grammys. Retrieved 7 November 2016. ^ "Billy Joel Visits The Howard Stern Show 11.16.10 by VideodromeVaultRadio | Videodrome Vault Radio | Free Listening on SoundCloud". Soundcloud.com. Retrieved 2016-10-12. ^ Ray Kelly (2008-07-06). "Billy Joel - The Republican interview". Masslive.com. Retrieved 2016-10-12. ^ Rose, Charlie. "Billy Joel Interview." The Charlie Rose Show, 1993. ^ Gordon Bock, "Phil Woods' Sax Keeps Showing Up." Dallas Morning News, August 6, 1978, p. 8 C.
^ "The Man - Barry White". Allmusic.com. Retrieved August 4, 2011. ^ "Australian-charts.com – Billy Joel – Just the Way You Are". ARIA Top 50 Singles. ^ "Item Display - RPM - Library and Archives Canada". Collectionscanada.gc.ca. Retrieved 2016-10-12. ^ "Item Display - RPM - Library and Archives Canada". Collectionscanada.gc.ca. 1978-02-18. Retrieved 2018-01-04. ^ "Charts.nz – Billy Joel – Just the Way You Are". Top 40 Singles. ^ ""Just the Way You Are" on the South African Singles Chart". Springbok Radio. July 28, 1978. Retrieved September 25, 2010. ^ "Billy Joel: Artist Chart History". Official Charts Company. ^ "Billy Joel Chart History (Hot 100)". Billboard. ^ Whitburn, Joel (2002). Top Adult Contemporary: 1961-2001. Record Research. p. 127. ^ "The Irish Charts – Search Results – Just the Way You Are". Irish Singles Chart. Retrieved November 26, 2018. ^ "Official Charts Company". Officialcharts.com. 1978-12-16. Retrieved 2018-11-26. ^ "Top Selling Singles of 1978 | The Official New Zealand Music Chart". Nztop40.co.nz. 1978-12-31. Retrieved 2016-10-12. Awards for "Just the Way You Are"
This page was last edited on 13 March 2019, at 21:11 (UTC).